Eid Mubarak to all my readers. 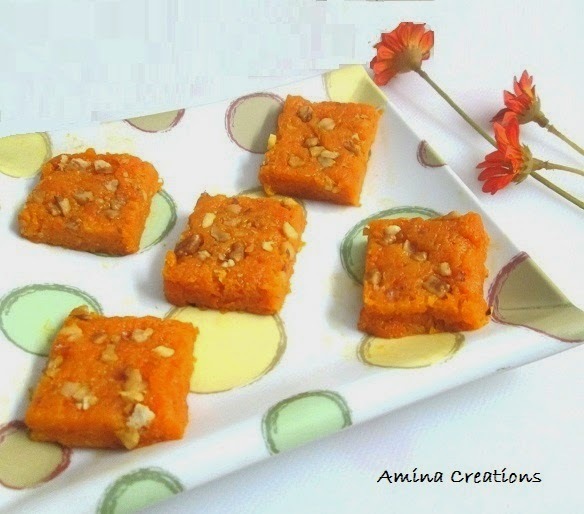 To celebrate the occasion, I am sharing the recipe of carrot halwa. This delicious halwa is easy to prepare and can also be served as a barfi. This is a perfect treat that you can serve your guests on Eid day. Add grated carrots and sauté for about 10 minutes till the raw smell goes and the carrots reduce in volume. Continue cooking and stirring till all the milk has been absorbed and the carrots are soft and cooked. When the halwa mix leaves the sides of the pan, transfer to a greased plate and form a rectangle. Garnish with chopped nuts on top and allow the halwa to cool. Place this inside the refrigerator for about an hour. Once set, cut into small squares (about 18) and serve.